Unique casserole-style chicken pasta stuffed bell peppers. 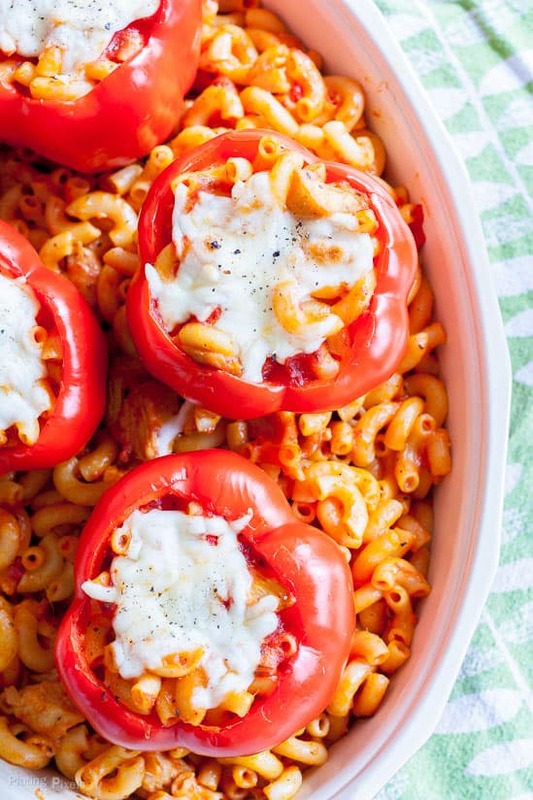 Ready to eat grilled chicken, penne pasta, mozzarella cheese, pasta sauce and red bell peppers are all you need for surprisingly quick stuffed bell peppers. Within this recipe post you’ll learn how to make a unique variation of stuffed bell peppers, and fast! Plus you’ll learn a trick to quickly cook bell peppers to a perfect crisp tenderness. Are you ready for a dare? I dare you to make a stuffed bell pepper recipe in about 10 minutes. Sounds crazy right? Normally you could barely get the ingredients prepped in that amount of time. I’ve taken a few liberties and shortcuts to make this a quick, but quality meal. It’s mostly heating and assembling the ingredients to make this Chicken Pasta Stuffed Bell Peppers recipe. That’s right, pasta stuffed bell peppers. This isn’t your standard bean and rice stuffed peppers. 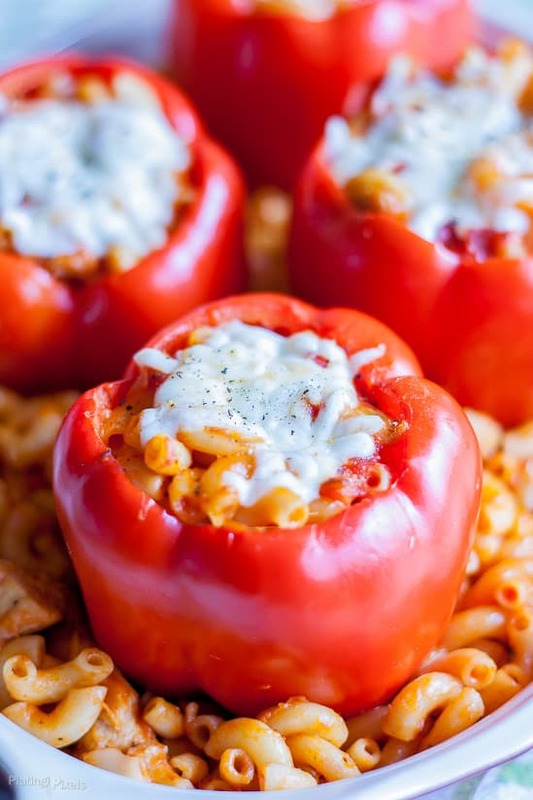 Think of it as a chicken pasta casserole in a healthy stuffed bell pepper. I often make things from scratch, and feature plenty recipes like this on the blog (for example try this completely from scratch Steak Bruschetta with Goat Cheese and Tomato Jam recipe). 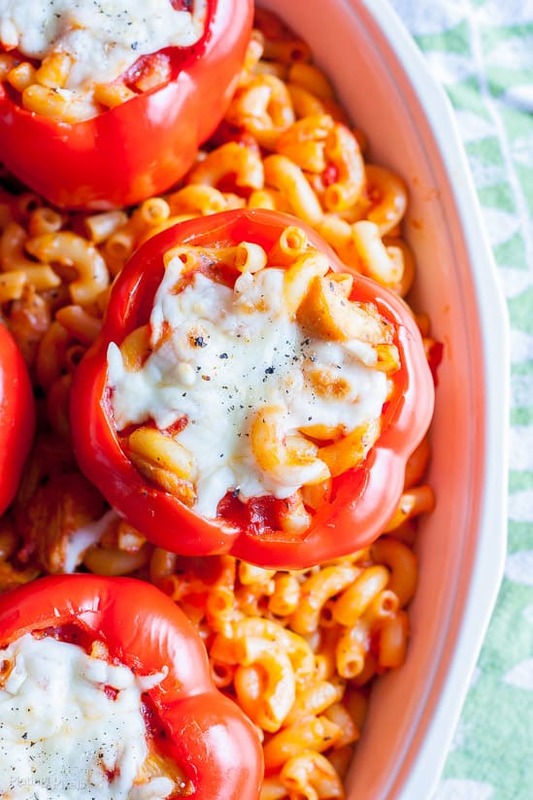 However a meal like this pasta stuffed bell peppers is a quick option for a weeknight meal, or when you want to have more time out the kitchen. 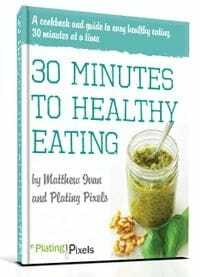 A couple key products are used to speed up this recipe. 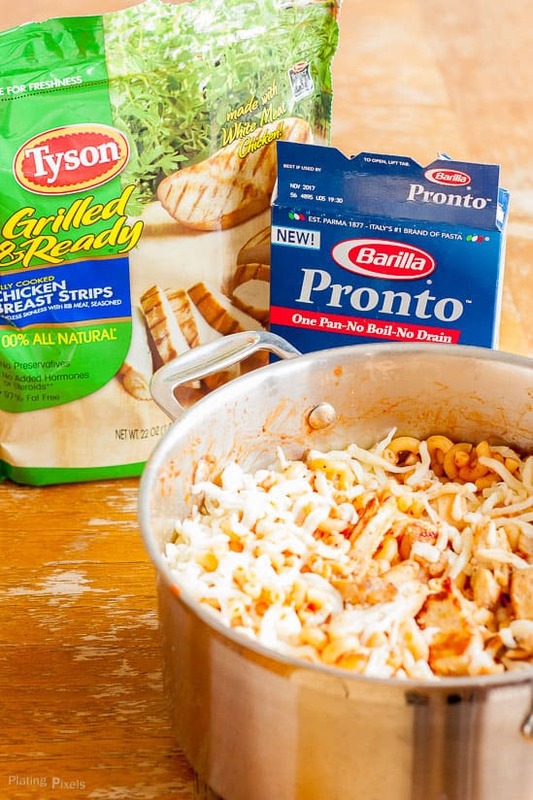 Tyson Grilled and Ready Chicken Breast Strips paired with Barilla Pronto Penne Pasta. 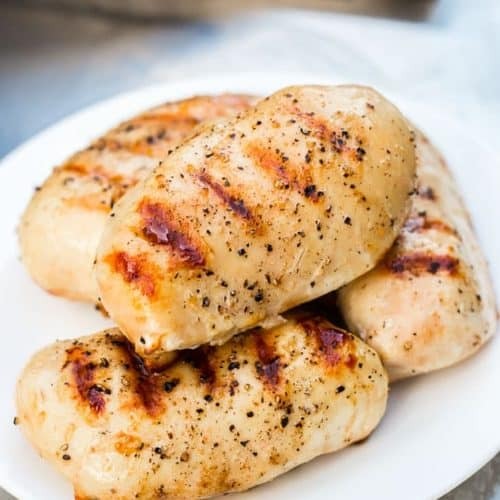 The chicken breast strips are fully cooked, without any preservatives. 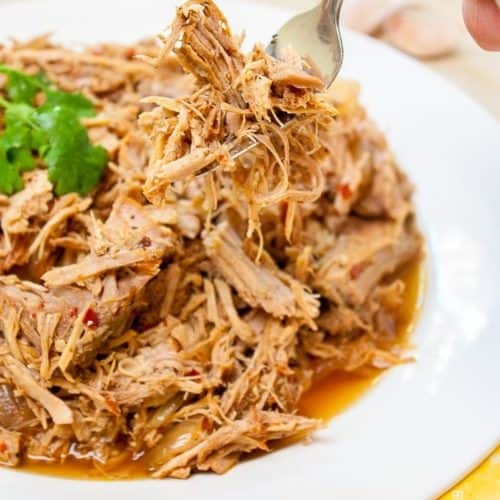 Just heat and serve for a protein rich meal. The pronto pasta cooks almost instantly; in one pot, no pre-boiling and no draining. I found both at my local Neighborhood Walmart Market. Ok, are you ready to cook fast? Everything can be made at the same time, then assembled for a 10+ minute gourmet meal. A traditional stuffed bell pepper recipe with rice would normally take at least 40 minutes. With all that extra time, I can enjoy a good book or watch a show with Olia. Check out more inspiration for #EverydayEffortless here! To start, cook the bell peppers. Roasting takes a long time, so to speed this part up I have a trick to cook them quickly, while still being flavorful and crisp (read the cooking tips section below). 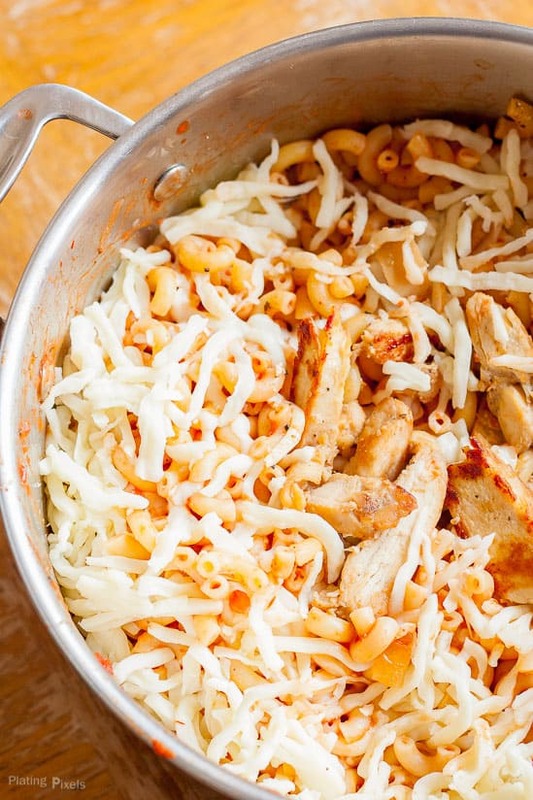 Meanwhile, cook penne pasta in a pan, and heat up chicken breast strips in a another pan. About 10 minutes later, combine chicken and pasta, add pasta sauce and cheese, then stuff into cooked bell peppers. The cheese melts, and no additional baking or cooking or baking needed. There’s plenty of ways to cook bell peppers. You can saute, stir-fry, bake, roast, steam, microwave, boil and grill. 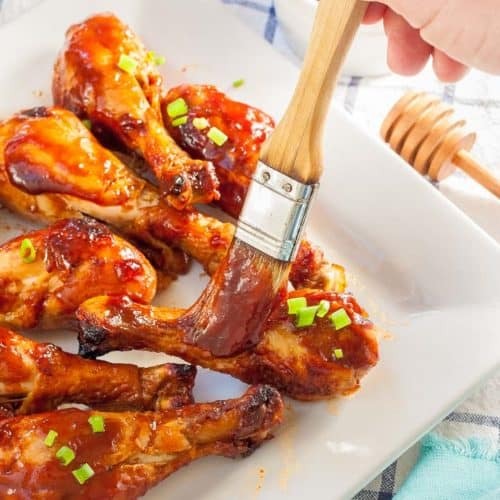 Roasting or grilling is a wonderful way to caramelize them and bring out more flavor. But microwaving is a great way to cook them quickly. The key to keeping them crisp and moist and to cook covered in a bowl of water, which basically steams them. Flavor profiles: Savory, meaty, tangy and cheesy. Texture: Al dente penne, tender and moist chicken and crisp fresh bell pepper. Easy, surprisingly quick casserole style chicken pasta stuffed bell peppers. Remove stem and seeds from bell peppers, but keep whole. Place in a large bowl of water, cover with plastic wrap, and microwave for 10 minutes on high. When done remove and drain excess water. Meanwhile: cook penne pasta according to package directions. Heat chicken breast strips in a separate pan according to package directions. Combine in one pan; stir in cheese, then stir in black pepper and pasta sauce. The cheese will melt if stirred in first. Heat mixture a few minutes on medium if desired. Spoon chicken pasta into cooked bell peppers. Optional: sprinkle with more cheese on top and heat to melt before serving. What do you normally stuff your bell peppers with? Such a clever idea, looks delicious! These look amazing! I am always looking for a good stuffed pepper recipe! Thanks Debra! You can never have too many stuffed bell pepper recipe ideas. these look amazing!! I’ve always stuffed peppers with rice, but this looks so good I am going to try soon!! That’s what I’ve always done too. Thanks Emily! Mmmm…I would’ve never thought of this combo, but it looks really good! It was a random idea that just came to me. Thanks Kim! You stuffed tomatoes with pasta?? You are now my favorite chef in the world! This one is stuffed bell peppers, but tomatoes sounds amazing too! Still love the compliment and thanks Rini! 10 minutes?! 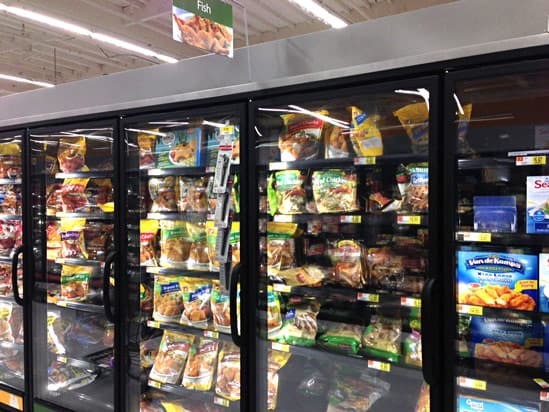 Wowza – I am looking for that pasta next time I’m at the store! This dish looks delicious and I LOVE the short prep time. I was surprised too Brittany! Hope you like the recipe! I love red bell peppers. Looks like a winner & great for week nights you need to fix an easy dinner. That looks so good. I need more stuffed peppers in my life. Don’t we all. Thanks Angie! This looks delicious Matthew! A interesting combo, but one worth trying it seems! I was trying to do a unique spin on stuffed bell peppers, so thanks Bethany! Those pre-cooked chicken strips are a handy thing!